Several leading industrial nations are beginning to substitute cheaper coal and and natural gas -- in place of more expensive crude oil -- in the production of high value "petrochemical" products, including valuable polymer feedstocks. The Methanol to Hydrocarbons process was discovered at Mobil Oil in 1977. 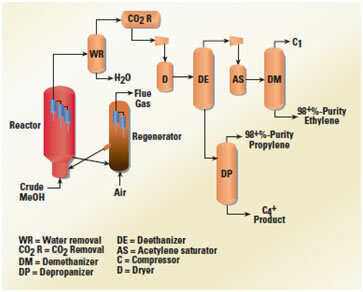 This process is used to convert methanol to products such as olefins and gasoline. The methanol can first be obtained from coal or natural gas. In the Methanol to Olefins (MTO) process, the methanol is then converted to olefins such as ethylene and propylene. The olefins can be reacted to produce polyolefins, which are used to make many plastic materials. An MTO process flow diagram advertised by Honeywell is shown below. Substituting cheaper and more abundant coal and natural gas, in place of crude oil, will make crude oil supplies go much further. Such substitution will also place a de facto ceiling, of sorts, on intermediate to long-term oil prices. The real energy prospect is the world now faces a problem of newly found, or newly developed, and ever increasing energy resources and supplies - not a crisis of energy scarcity. Besides displacing crude oil from the petrochemicals business, coal and natural gas will be displacing more and more crude oil from the petrofuels business. Gas to liquids (GTL) and coal to liquids (CTL) are gradually becoming more economically profitable, at the same time that crude oil prices have been creeping upwards. As biomass to liquids (BTL), kerogens to liquids (KTL), and gas hydrates to liquids, become ever more viable, conventional crude oil will find itself competing with massive hydrocarbon resources amounting to many trillions of barrels of oil equivalent. Yet another story about Russia's Gazprom being forced to confront the global reality of tight gas resources. Russia's national oil & gas companies had been growing fat and lazy, not to mention corrupt. It looks as if Russia will be forced to ask for outside help to develop its huge tight oil & gas resources -- before it gets priced out of European and some Asian markets.